Google has added video playback to its Google Docs facility. 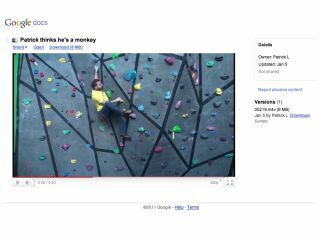 Although users could already share videos by uploading and downloading them in Google Docs, the new functionality allows you to play them directly from the cloud without downloading a single byte. Videos up to 1GB can be uploaded, but you'll need to install Flash in order to watch them back. Some videos uploaded before the change to the cloud-based software may not have processed yet, but Google says these will be available soon. It's worth noting that Google needs a bit of time to process the video so it won't necessarily be available for watching straight away. For more immediate video playback, you may be better off using Google-owned YouTube.